Kirby Heyborne loves Ray Bradbury, and his enthusiasm about narrating A MEDICINE FOR MELANCHOLY is infectious. Listen as he shares insights into and excitement over this collection of captivating short stories. Strange forgotten towns, attics that transport one back in time, mystical visitors in the night—narrator Kirby Heyborne takes listeners through these subtly strange tales with the steady grace and tempo of a pro. Heyborne presses his own unique stamp into the words of master storyteller Ray Bradbury as everyday life collides with magic and surrealism. Kirby narrates audiobooks for adults, such as MISTER MONKEY, and audiobooks for young listeners, including SAVING WINSLOW and THE SKY AT OUR FEET. Check out his full and extensive audiography. Now Hear This: Kirby Heyborne. Written By: Joyce Saricks (author). First published May 15, 2018 (Booklist). 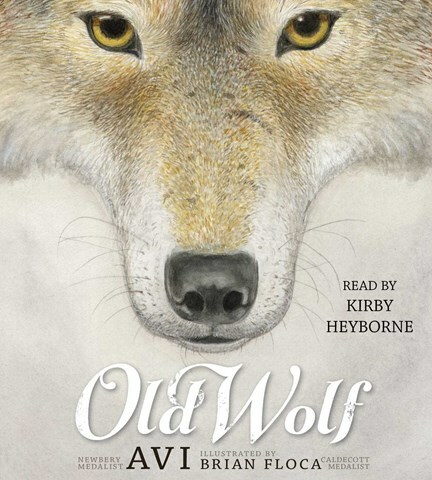 Acclaimed for his youthful voice and the skill with which he reflects emotions and channels authentic characters, Kirby Heyborne makes magic in the audiobooks he narrates. 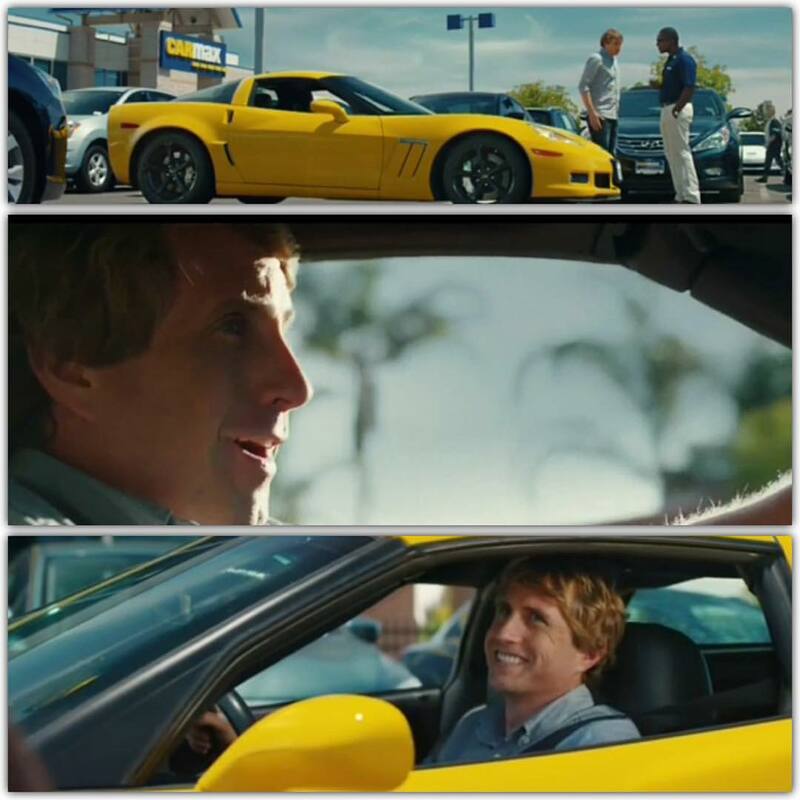 100 Sideways Miles. By Andrew Smith. 2015. 7hr. Tantor, CD, $34 (9781494514099). Gr. 9–12. Finn Easton’s life has been marred by two events: the freak childhood accident that killed his mother and caused his epileptic seizures and his father using him as the model for his cult sf novel. In a performance as intense and emotional as it is humorous, Heyborne explores Finn’s coming-of-age story, powerfully depicting memorable characters. The Dreadful Tale of Prosper Redding. By Alexandra Bracken. 2017. 10hr. Recorded Books, CD, $87.75 (9781501962387). Gr. 4–7. Unexceptional Prosper Redding seems to be a misfit in his powerful family until he discovers that he is host to an ancient demon, one with revenge on all Reddings on its twisted mind. Heyborne creates spot-on voices for the varied cast and highlights the chuckle-aloud humor as well as the hold-your-breath suspense. Four-Four-Two. By Dean Hughes. 2016. 7hr. Recorded Books, CD, $66.75 (9781501926815). Gr. 7–10. Heyborne’s reverent narration honors Hughes’ novel and the courageous Japanese Americans of the highly decorated 442nd Infantry Regiment Combat Team as he follows two Japanese American friends in WWII. He convincingly conveys all the emotions the young men experience: fear, tension, tenderness, mercy, anxiety, and courage. How husbands and wives can connect during their busy lives. How to keep a positive attitude during the rough times of fatherhood. Kirby’s wife’s three finger approach to keeping Kirby in line. Lessons Kirby has learned from acting that he has applied to his parenting. How to keep focus on your family during the busy career life. Living a life with high morals when you are working in the movie industry that does not value high morals. The importance of finding ways for a father to connect with their family. Warning: this song will brighten your day! The chorus has an awesome 80s feel. This kid is only 16! I love everything about audiobooks: the stories, characters, authors, producers, publishers, and the listeners. Thank you to those who like hearing me tell a story. I am honored and blessed. 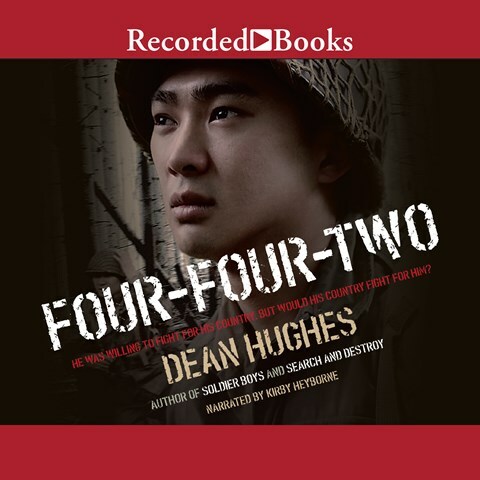 Four-Four-Two by Dean Hughes Winner of AudioFile Earphones Award© "Heyborne's voice captures the heroism that these forgotten patriots showed on a daily basis"
During WWII, the 442nd Regimental Combat Team, composed solely of Japanese-American soldiers, became one of the fiercest and most highly decorated units in the U.S. Army. Finding a fine vocal balance between youthful confidence and understandable apprehension, narrator Kirby Heyborne completely draws the listener into the story of two Japanese-American men, boys really, who leave the poverty and indignity of the internment camps to join the army. In the battle scenes Heyborne's voice captures the heroism that these forgotten patriots showed on a daily basis. His voice shines even more brightly when describing the personal drive it took to insist that they not to be left behind when it came to serving their country and honoring their families back home. Read more and listen to a sample from the book! 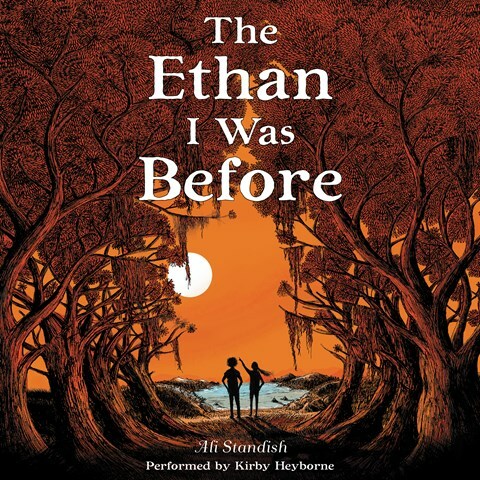 The Ethan I was Before by Ali Standish Winner of AudioFile Earphones Award © "A perfect listening experience!" Awesome out of body experience: watching my favorite show The Last Man on Earth and Will Forte said my name! I had a great time talking with Tyson and Jeremy from College of Champions. Listen to and download the interview on the College of Champions website and on iTunes. October 12, 2015 - "Keeping Up with Kirby Heyborne"
Kirby Heyborne plays Elder Calhoun in "The Best Two Years" in 2004. 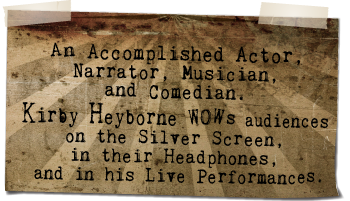 Heyborne continues his acting work and has expanded to include narration and music work as well. The 2004 film "Sons of Provo" contains a scene in which three musicians — Will, Danny and Kirby — struggle to think of a name for their band. After much deliberation, Kirby suggests a simple label: "Everclean." He thinks his comment has gone unnoticed until a few seconds later, when Will repeats "Everclean" as though he'd come up with it himself. As Danny lauds Will's ingenuity, a visibly frustrated Kirby can only manage a half-hearted assent for the praise that should have been his. 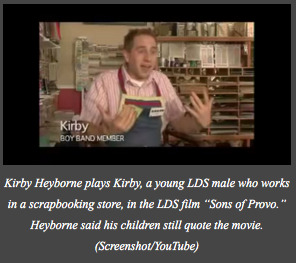 Well-known LDS actor Kirby Heyborne portrayed the character who shares his name, and this scene is legendary in his house. "It's my kids' favorite," Heyborne said in an interview with The Universe. "Whenever someone in our family feels like they're being ignored or they're not being heard, they just have to say 'Everclean' and we all know what they're talking about." It's easy to act excited when you love your job as much as I do! 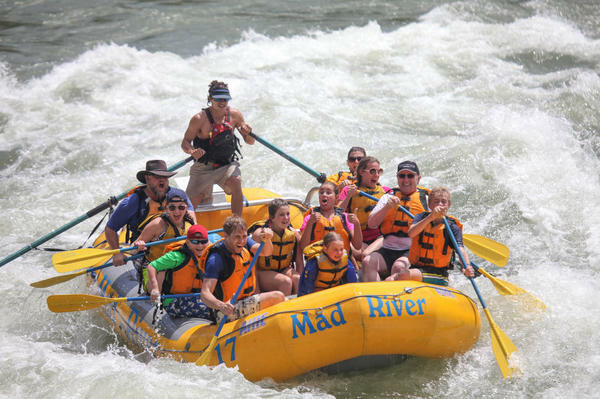 Heyborne... recalls traveling with his father, Bruce,... to visit Teton National Park and float down the Snake River. “You know how when you’re reading a great book, you want to throw everything aside and just spend eight hours reading it?” [Kirby] asked AudioFile Magazine. “I get paid to do that!” -- LDS Living Magazine interview with Kirby. Written by Jake Healey. Kirby Heyborne, an actor best known among LDS audiences for starring in The R.M., Saints and Soldiers, and The Best Two Years, has also been achieving prominence in another performance field—audiobook narration. Heyborne, who has narrated over 300 titles (including Gillian Flynn’s Gone Girl, Stephen King’s The Long Walk, and many works by fellow Latter-day Saint Orson Scott Card), was recently honored with Booklist’s 2015 Voice of Choice award. “This is a huge honor,” said Heyborne. “I love my job and am amazed that I get to keep doing it.” Read full article at LDSLiving.com. 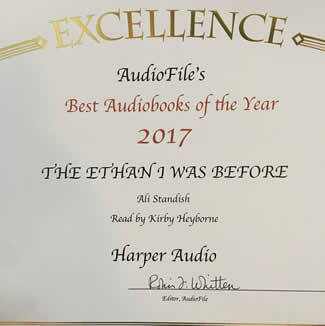 Following the recent announcements at the ALA Midwinter Conference in Chicago, Kirby has four Audiobook performances seclected for awards. The Madman of Piney Woods was named an ALSC Notable Children’s Recording. In the words of the ALSC committee: “J.D. Jackson and Kirby Heyborne superbly tell the story of two boys, one the descendant of slaves and the other of Irish immigrants, in this companion book to Elijah of Buxton.” You can read more about the ALSC Notable Awards here. Hollow City – "Heyborne’s superb narration captures the children’s terror and determination as they continue their quest, despite the monstrous creatures that pursue them." Noggin – "The standout of this narration is how Heyborne excels at conveying the quiet, tender moments of Travis’ story." Read more about the YALSA Amazing Audiobook for Young Adults Awards here. See the full list of Listening Library’s ALA Award Winners here. I love my job as an audiobook narrator. During an open house for Penguin Random House, I was interviewed by a real NPR reporter! It's a quick 4 minutes. Take a listen! November 2014 - Audiofile Magazine announces their prestigious list of "Best Voices of 2014". Kirby Heyborne is named along with several other of the most talented narrators of the year. Congratulations to all! (New York) - Ever evolving, the voice over industry reached a significant milestone here Sunday night with presentations of the 1st Annual Voice Arts™ Awards, honoring and celebrating best work and achievements in voice over talent, production and other aspects of the voice over business. Join Disney Dudes host, Kevin Rast, as he learns more about Kirby, his connection with Disney, and why he loves Disney! Kirby Wows Librarians with a Rap Song! Say What? "'Ain’t Nobody Change the World Like a Librarian,' will surely go down in ALA Annual history as one of the best surprise moments experienced by a crowd of librarians...." Read full article and watch the FULL VIDEO on the Books on Tape website. If you're looking for the lyrics, this is your lucky day! Click this link (LYRICS, CLICK HERE) and you shall have them! Kirby has been invited to MC and perform as a solo artist at the 1st Annual Santa Clarita Valley Americana Folk Fest July 5, 2014. For more information please see the Americana FolkFest event page on facebook. June 27, 2014 - Kirby Sings The National Anthem at Dodger Stadium — Watch the Full Performance! The event, known as "Mormon Night," is the longest-running community event held by the Dodgers, and has gone on for more than 25 years. As part of the game's opening ceremony was beloved LDS actor Kirby Heyborne, who sang the national anthem with Eric Christiansen. A Night of Love and Laughter with The Society. Tickets can be purchased online or at the door! Enjoy the Christmas Spirit in a unique and traditional way! Free parking is available at the nearby California Institute of the Arts and shuttles will be provided to and from the program. Tickets go on sale August 29. Cost is $6 for BYU-Idaho students, $12 for general public. No children under four. Classroom dress. WE ARE BOOKING SPEAKING ENGAGEMENTS, ACTING WORKSHOPS, CONCERTS & PRIVATE CONCERTS with Kirby. If you're interested in hosting Kirby for an event, email gracia@kirbyheyborne.com for information. Check the calendar page for complete information on shows and appearances as they come up. I hope to see you soon! Book my AWARD WINNING, traveling COMEDY TROUPE, "The Society"! My friends and I will bring our show to you and entertain your friends, co-workers, employees, family or mortal enemies with a show that can be tailor-made to fit your group and your event. We also teach improv clinics and classes. Shoot me an email to find out more! Click here to find out more and book your date with funny. Kirby is currently touring the country enchanting audiences with his intimate songs, storytelling and wit. Book Kirby for concerts and speaking engagements. We welcome requests from concert halls & venues, symphonies, festivals, corporations, universities, youth groups, ya groups, firesides, private parties/individuals, and special events.